You are currently browsing the category archive for the ‘orchards’ category. apples = juice, cider…and theatre? Apples, apples, apples. A more applier a weekend you’d be hard pushed to find. After our hectic Saturday of collecting up apples we were due to celebrate a friend’s birthday that evening. It was a surprise arranged for Jane, the birthday girl, by another mutual friend and we hadn’t a clue, when we pushed open the door to South Zeal’s Victory Hall, what to expect. We walked in on one Peasgood Nonsuch’s Heathen Harvest! What? What on earth…? I hear you exclaim. 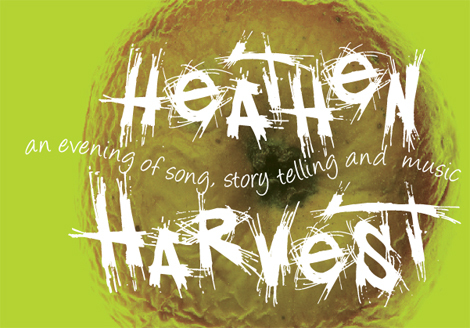 So, to explain briefly in the words of the Common Players themselves ‘they are an arts organisation who seek to engage people in a positive and playful way’ – Cider-with-roadies, of which Heathen Harvest is their newly commission evening show, ‘uses creative activity to enthuse people about local produce’. None the wiser? Not surprised. It’s taken me sometime to get there. But it’s well worth the effort. Wow; Heathen Harvest is an exuberant roller-coster performance, bursting with energy, based on music hall, slapstick and cabaret traditions. And as we, the audience, sat at tables quaffing cider, feasting on a delicious community harvest supper, we were entertained by the players with an eclectic, hilarious and poignant selection of stories, songs, sketches and puppetry. These had all been drawn from research done by the writer, Jonathon Stokes, of local Devon apple workers and cider makers. It was tremendous, hugely enjoyable and unexpected. What a way to celebrate Pomona, the goddess of fruit trees, gardens, and orchards. 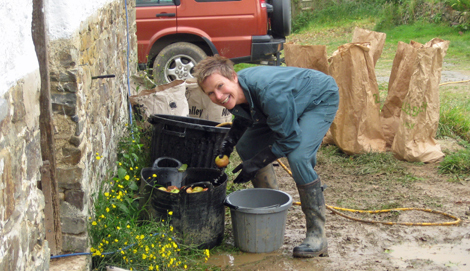 caught with head in a bucket - washing apples! Up for an early start on Apple Pressing Sunday. After checking and feeding the stock we loaded the truck – already groaning under the weight of apples – with fermenting barrels for cider and old water containers and saved milk bottles for juice, and departed for our rendezvous with apple mill and cider press. A system soon established itself of apple washing, milling and pressing; filling juice bottles (time consuming), cider barrels (less so), removing the old pressed cheeses to the compost heap, and refilling the press with fresh pulp. We worked hard and relentlessly, breaking for an apple soup, sausages and apple cake lunch, plus a quick cup of tea. It was growing dimpsy as we loaded the last barrel into the truck and hosed down the equipment and barn. 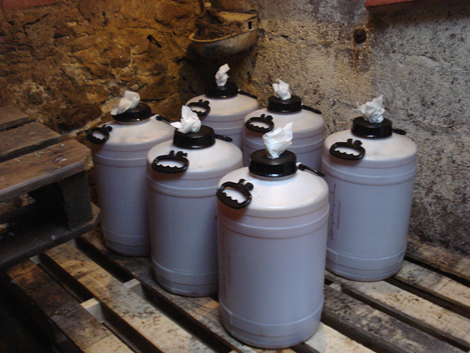 And do you know what…we’ve made approximately 185 litres, 320 pints or 40 gallons of cider and 6 gallons of juice! A weekend of pure apple inspiration. Thank you to all who made it possible.